Why are we looking at the outside? Let's get into the dungeon! This is a really well presented module. 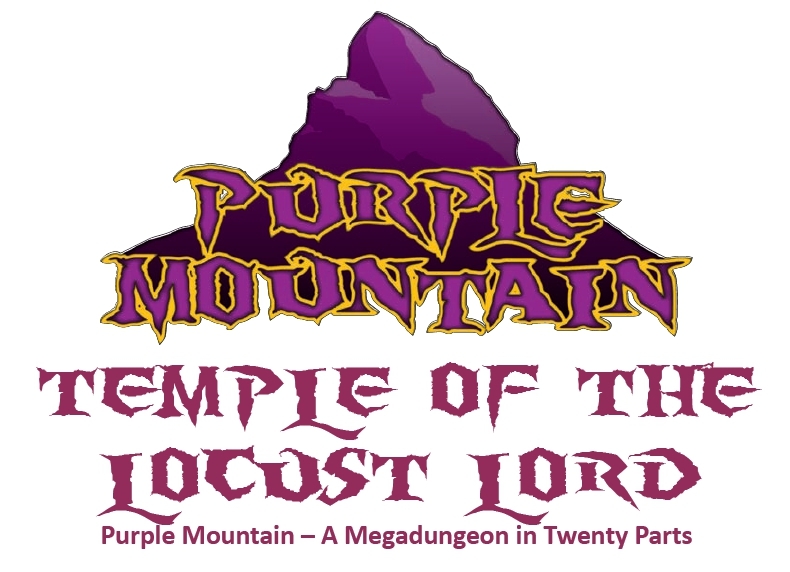 Although it represents one level of the Purple Mountain megadungeon, it could also be played individually in a low level campaign for pathfinder / DnD3.5 – but could easily be adapted by a confident DM to most systems, since there’s a focus on environment and some NPC motivation/tactics - enough "meat" for any system. 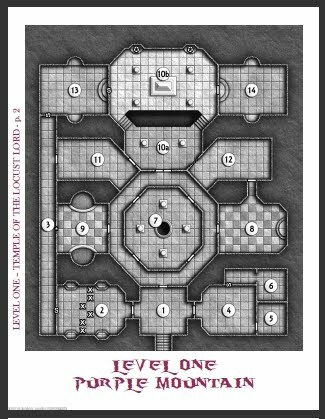 Don’t be fooled any negative associations with the term “Megadungeon” – the encounters follow logically, the adversaries are consistent with a dungeon population and themes, there’s also few nods to dungeon ecology. The dungeon level has a traditional gaming feel, but the descriptions are modern and slick. 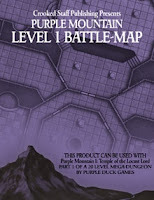 Purple Mountain 1 ‘Locust Lord has inherited from classic dungeoneering style the very best elements of play and plot by the way it is guided by the physical environment of the dungeon - which was the original purpose of a original D&D dungeon - as opposed to the war gaming open field of battle. 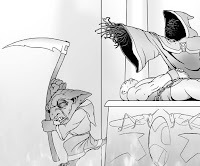 The DM is given plenty of “what if/then” guidance if the players are struggling or alternative approaches to reaching the end points of the plot. Appendices (inc. Monster stats) and inset tip boxes make this scenario very easy on the eye and implies minimal preparatory work on behalf of the DM. Lush map of the level. I’m especially excited about this product because it can be played using it’s sister product – a gorgeous and massive battle-map by CSP (briefly looked in my post here). I’m a sucker for glossy play aids. As I type this, the product is at an absolutely bargain price for what you get. Disgustingly cheap! 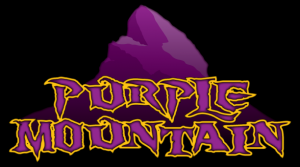 If you don’t buy this product now, definitely keep an eye out for deeper levels in the Purple Mountain. 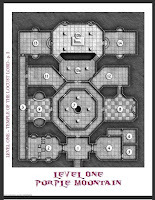 Again – this is playable as a single dungeon in its own right, the fact that it is part of a series of a huge sprawling megadungeon structure is a plus. "Mega-dungeons" are almost a sub-genre of published adventures in themselves, if the OSR blogs I read are are anything to go by. Curiously enough, this guy is adapting Purple Mountain 1 to suit his T&T campaign. Seriously fast play!